Nick Le Blanc started off in martial arts when he was just 9 years old. Like most boys his age, his imagination was in overdrive and he loved the world of ninjas and Naruto. He daydreamed of fighting like the Teenage Mutant Ninja Turtles. In reality, he had just moved to a new city, and the transition into grade three was difficult and scary. On his first day, Nick got into a scuffle with a kid. Little did he know the fight would eventually lead him into the world of mixed martial arts (MMA) as a fighter and a kids instructor under the tutelage of Sheila Bird, Champion’s Creed grappling world champion. A super shy kid, Nick yearned to fit into his current surroundings in Calgary after moving from his home in Windsor, Ontario. Nick already struggled with his focus and concentration in elementary school, and an unfamiliar environment became even more of a challenge. "It (moving) was a bit of a culture shock and likely sparked the altercation"
Sitting in the principal’s office, Nick and his playground foe realized they had common interests. The next day, he was invited by his new friend to try out Muay Thai at a local gym. Nick’s initial interest in Muay Thai brought him out of his shell. "It did wonders for me. I could speak my mind. I was relieved that someone would take the time to listen to my opinion and get down to my level, instead of telling me what to do. "At school, kids are often told to sit down and listen all day. At the gym, I could be loud, have fun, and express myself. With his new-found love of Muay Thai, Nick’s fear of physical confrontation started to fade, as he became more confident of his fresh skills and learned how to defend himself. Nick’s MMA training at Champion’s Creed under the tutelage of Brian Bird, Head Brazilian Jiu-Jitsu Coach, and Chad Sawyer, Head Muay Thai Coach, gave him these tools that he would later teach to other kids. Watching ninja movies and shows, he thought Muay Thai was the coolest thing, like being trained as a ninja. That was his mission: he wanted to go to a class, be himself and have a lot of fun. Nick became confident enough to say anything to his peers without the fear of getting beat up. He developed the control to walk away from a street fight or an altercation, instead of getting involved. "This (self-control) is my superpower that I love, that I’ll have for the rest of my life. Another powerful philosophy Nick learned from Champion's Creed was that you only defend yourself if it’s absolutely necessary. It’s all about the confidence you have in yourself. Nick was hooked on Muay Thai and trained five days a week. The positive effects of the training soon trickled down into the rest of his life, as he started to excel in school and become a better all-around athlete. Nick was inspired by his coaches to think outside the box and to create his own style, which was more on the creative side. The encouragement to think differently than other kids was very powerful for him. 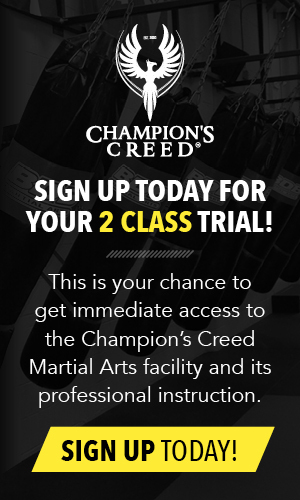 Nick was drawn to Champion’s Creed gym from afar and convinced his parents to sign him up for classes. During his training at Champion’s Creed, Nick learned about respect, focus, and self-control, which later inspired him to help other kids like himself. For Nick, the transition of going from a teenager to adulthood was difficult. But as soon as he went through the door at Champion’s Creed, he felt like he was part of the family. He hasn’t looked back since. Nick finally started to feel focused and noticed a big difference in his grades. Up until the teenage years, he still struggled to focus on school work. His turnaround in school happened when he connected martial arts learning to how he learned in school. Martial arts taught him about delayed gratification; he learned to work hard for something even if he didn’t see the rewards right away. "A lot of kids understand that only physically, at first. 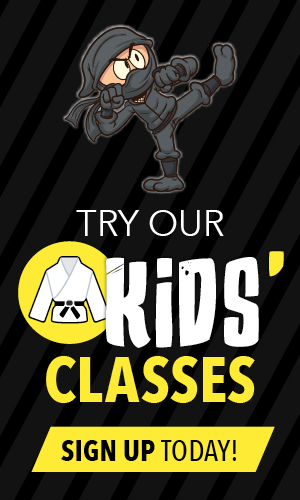 If you can teach kids to focus their control in martial arts, you can apply that to how they learn at school. At 14, Nick was a small kid for his age so he didn’t compete as an amateur fighter until a few years later. But, he grew tired of stand-up striking and yearned for something new. He was inspired by MMA fighter George St. Pierre and watched his fights on TV every chance he could. "I looked up to him (St. Pierre); he was my definition of Superman. He was winning all these championships, and he was also French Canadian. As a teenager, Nick learned he could finally sit down and read a whole book with complete focus because he knew he would learn something from it. Like his classes at Champion’s Creed, he kept going back because he learned something new every time. At 20 years old, Nick has come a long way. But, he’s still reaching for the top. He strives to help other kids who are in the same boat as he was as a young kid. Nick recently joined Champion’s Creed crew as an instructor where he teaches Muay Thai to kids aged 5 to 13 years old. 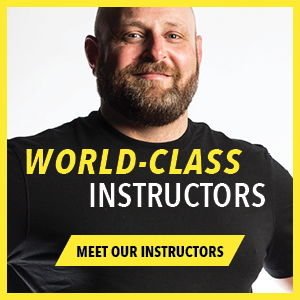 He was also fortunate to attend a 16-hour kids instructor program offered by Champion’s Creed, taught by Matt Hache of the Ottawa Academy of Martial Arts. The course, offered to all of the gym’s training staff, teaches instructors to mimic kids’ behavior, get down to their level, and talk to them eye-to-eye with respect. The renowned kids program also teaches spotlighting, a technique focused on positive reinforcement. Spotlighting highlights kids practicing something well, such as sitting nicely in a ninja stance, instead of focusing on any bad behavior. This positive reinforcement in front of a class full of kids brings attention to good behavior, which is then emulated by everyone. This style of instruction is the cornerstone of the Champion’s Creed’s kids instructor program and works effectively for kids at any age. "A lot of kids are told what they do wrong all the time, like at school, and that’s not how kids’ brains work efficiently; they’re not ready for that type of criticism. 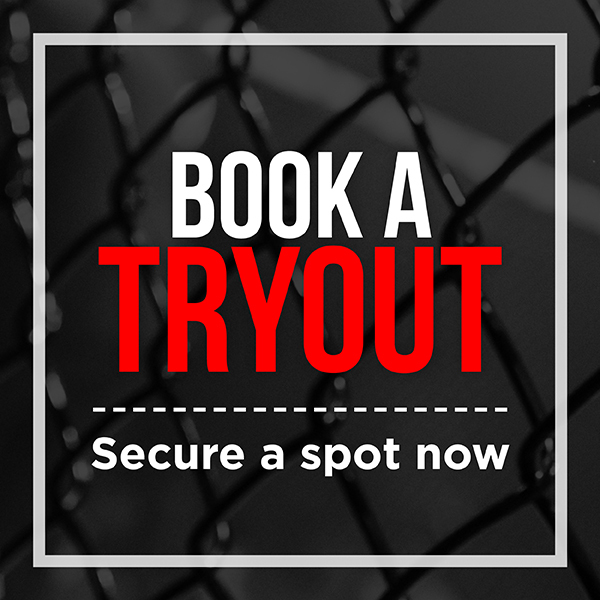 As well as competing and winning amateur MMA fights, Nick has been teaching kids at Champion’s Creed since March 2018. Nick helps kids gain the confidence they need to eventually become strong adults, both mentally and physically. This is an important lesson that he learned from Champion’s Creed coaches. “It’s great to pay it forward because I know how much it helped me as a kid. When Nick was a kid he learned Muay Thai amongst kids aged 9 to 12 years of age, which helped him to balance his learning and teaching, even at a young age. "Kids develop at different rates so being in a mixed age group really helps. You learn from the older kids, and at the same time, you’re helping out the younger kids, as they watch you. While Nick puts his energy into teaching kids Muay Thai twice a week, he’s also moving ahead as a competitor. After a few canceled bouts this spring due to injuries (both his own and his opponents’), he will fight in the IMMAF World Championship in Bahrain in November. Getting ready for the tournament style fights, Nick is focused on his grappling skills. He’s required to complete the whole tournament with the potential to fight up to three fights in the same number of days, which can be taxing physically and mentally for even a seasoned fighter. Despite the challenges, Nick welcomes the competition as he’s trained his whole life to be a strong powerful fighter. With the continued support from the coaches and his peers at Champion’s Creed, Nick is well on his way.